CARD NUMBER IS #FA-JI. To CANADA. C. ST2-IT, What a great pair these 2 great players were together. 2007-08 Upper Deck. SPX Hockey. 2007-2008 FLEER HOT PROSPECTS HOT COMMODITIES NUMBERED CARD. CARD IS NUMBER 118 AND IT IS NUMBERED. Card is in nrmt/mint condition. Card is serial numbered 039/100 made! All cards are NM or better. "SP NOTABLES"./1999. 2007-08 Upper Deck Hockey. "SP AUTHENTIC". The card number is #150. To CANADA. #0924 & 1310/1999 . CARD NUMBER #83. To CANADA. YOU ARE LOOKING AT A. 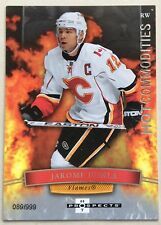 2007-08 UPPER DECK TRILOGY JAROME IGINLA HONORARY SCRIPTED PATCHES #SSJI 01/10! "HOT COMMODITIES". 2007-08 Upper Deck. FLEER. HOT PROSPECTS. 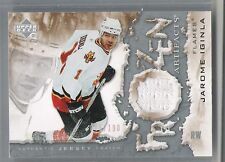 2007-08 UPPER DECK ICE JAROME IGINLA FROZEN FABRICS PATCHES BLACK #FFJI 04/10! 2007-08 UD THE CUP FOURSOMES IGINLA/GAGNE/ST.LOUIS/CHEECHOO 4/10 #CJ4-IGSC! LOUIS/CHEECHOO 4/10 #CJ4-IGSC! Grab this now! CARD NUMBER #53. ULTIMATE SPORTSCARDS. To CANADA. 2007-08 UD SP GAME USED JAROME IGINLA AUTHENTIC FABRCS PATCH #AFJI 20/50 3CLR! This Card is in NrMint condition or better. #246 OF 249! UPPER DECK. THE CUP BASE CARD. CARD FEATURES. It is numbered 23/100. This card is in NM condition. The scan will show any imperfections, especially along the edges and corners. Any significant variations from the following conditions will be noted above. We are located on Ventura Blvd. in Studio City California and featured on ABC's New TV show Karen Sisco episode entitled Dumb Bunnies.